The News We have All Been Waiting For…. A cure for diabetes is within reach after scientists developed a treatment that eliminates the need for sufferers to inject insulin. The therapy involves a one-off transplant of laboratory-grown pancreatic cells, which scientists have finally succeeded in producing in large enough volumes to be able to treat patients. The cells worked normally for many months when implanted into mice, and the first human patients should undergo the treatment in the next few years. The breakthrough by Harvard scientists was hailed yesterday as a medical advance potentially as significant as the advent of antibiotics. Jose Oberholtzer, an expert in transplantation at the University of Illinois at Chicago, predicted the development would “leave a dent in the history of diabetes“. About 400,000 people in Britain have type 1 diabetes, including 30,000 children. The breakthrough could also help 10 per cent of Britain’s three million type 2 diabetes sufferers. The advance is the culmination of 23 years of research by the Harvard scientist Doug Melton, who began working on type 1 diabetes when his son, Sam, had the condition diagnosed in childhood. Professor Melton said yesterday that his team was now just one step away from the finish line, adding: “It was gratifying to know that we could do something that we always thought was possible, but many people felt it wouldn’t work. Chris Mason, professor of regenerative medicine at University College London, said that if confirmed in a clinical trial the impact on diabetes would be “a medical game-changer on a par with antibiotics and bacterial infections”. The scientists are now in the last stages of animal testing in nonhuman primates. Type 1 diabetes, which normally begins in childhood, is an autoimmune disease in which the body kills off all its pancreatic beta cells. The cells produce insulin, which regulates blood sugar. Without beta cells, the body’s sugar levels fluctuate wildly, meaning that patients need to monitor glucose and typically inject insulin several times each day. In a study, published today in the journal Cell, Professor Melton’s team used embryonic stem cells and adult cells that had been genetically “rewound”. Both these cell types have the ability to turn into any cell type in the body, but require the right biochemical environment to be “coaxed” down a particular developmental route. 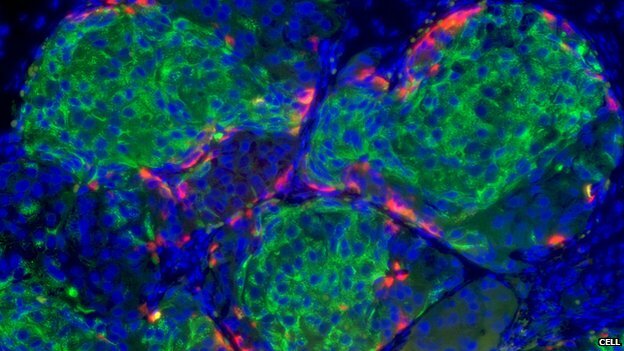 Scientists have struggled for years to get the set-up right to produce the volumes of pancreatic cells that would be necessary for clinical use. Professor Melton’s team appears to have cracked this problem by identifying an efficient way to turn both stem cell types into beta cells. When the cells were tested in the laboratory, they produced insulin, responded to glucose and appeared to work normally for many months when implanted in mice. Crucially, a single production line of cells could be used to treat all patients, rather than each person needing their own genetically matched treatment, the study suggests. Before being transplanted into the mice, the cells were placed in a porous capsule, which allowed insulin to diffuse out, but protected the cells from attacks by the body’s immune system. This eliminated the need for geneticmatching to patients, meaning that cells could be produced on an industrial scale and used in patients without the risk of immune rejection. A further advantage would be that the capsule of cells could be quickly removed and replaced if it stopped working. Although insulin injections help to keep glucose levels broadly in check, they do not match the body’s fine tuning, and this lack of control can eventually lead to complications from blindness to the loss of limbs. Richard Elliott, of Diabetes UK, said that the treatment could “transform” the lives of people with the condition, although it was likely to be years before the cell-based therapy could be used routinely. “It could mean they no longer need to use insulin, which would be a historic breakthrough,” he added. The treatment could also help the one in ten sufferers of type 2 diabetes who rely on insulin injections. Type 2 diabetes, which is diet related, occurs when the insulin cells stop working properly or when the body stops responding normally to insulin. The discovery of a new type of “good” fat made in the body could help to prevent and treat type 2 diabetes. The previously unidentified lipid molecules increase insulin sensitivity and blood sugar control. Unlike omega-3 fatty acids found in oily fish, the good fat named fatty acid hydroxyl fatty acids, or FAHFAs, are molecules found in fat cells as well as other cells throughout the body. The NHS estimates that in England there are 3.1 million people over 16 with diabetes but by 2030 the figure is expected to rise to 4.6 million, with nine out of ten sufferers having type 2 diabetes. The new findings, made by a team of scientists from Beth Israel Deaconess Medical Center in Boston and the Salk Institute in California, were published online by the journal Cell. He had to overcome scepticism and political hurdles. In 2001 he secured private funding when George W Bush cut research into new stem cell lines. In 2007 he appeared on Time magazine’s list of the 100 most influential people. 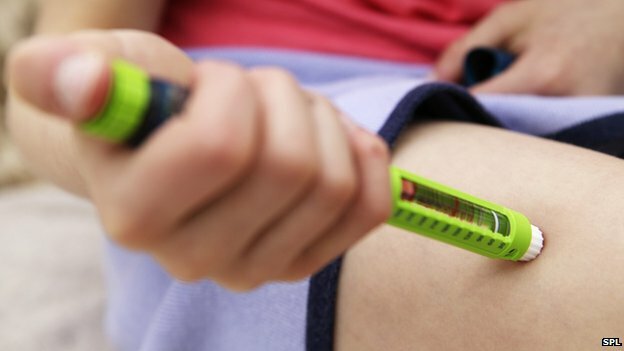 The hunt for a cure for type 1 diabetes has recently taken a “tremendous step forward”, scientists have said. The disease is caused by the immune system destroying the cells that control blood sugar levels. A team at Harvard University used stem cells to produce hundreds of millions of the cells in the laboratory. Tests on mice showed the cells could treat the disease, which experts described as “potentially a major medical breakthrough”. Beta cells in the pancreas pump out insulin to bring down blood sugar levels. But the body’s own immune system can turn against the beta cells, destroying them and leaving people with a potentially fatal disease because they cannot regulate their blood sugar levels. It is different to the far more common type 2 diabetes which is largely due to poor lifestyle. Perfect cocktailThe team at Harvard was led by Prof Doug Melton who began the search for a cure when his son was diagnosed 23 years ago. He then had a daughter who also developed type 1. He is attempting to replace the approximately 150 million missing beta cells, using stem cell technology. He found the perfect cocktail of chemicals to transform embryonic stem cells into functioning beta cells. Tests on mice with type 1 diabetes, published in the journal Cell, showed that the lab-made cells could produce insulin and control blood sugar levels for several months. Dr Melton said: “It was gratifying to know that we could do something that we always thought was possible. If the beta cells were injected into a person they would still face an immune assault and ultimately would be destroyed. More research is needed before this could become a cure. ‘Game-changer’Sarah Johnson, from the charity JDRF which funded the study, told the BBC: “This isn’t a cure, it is a great move along the path. It is a tremendous step forward. Prof Chris Mason, a stem cell scientist at University College London, said: “A scientific breakthrough is to make functional cells that cure a diabetic mouse, but a major medical breakthrough is to be able to manufacture at large enough scale the functional cells to treat all diabetics. “This research is therefore a scientific and potentially a major medical breakthrough. Dr Gillian Morrison, from the University of Edinburgh, agreed that this “represents a real advance in the field”.